Yes, it's true. After 44 seasons of haunt reviewing (18 of those online), we're going to be giving it a pass this season. We're going to be in Japan for most of October and November. Since a lot of area haunts now open in September, we could review a few, but if we couldn't cover all of our 'core' haunts-the haunts that we've been doing each and every season for years and that have become our dear friends-we felt it better to not review any rather than to exclude a single one. Since there's a veritable glut of local and 'national' haunt websites (both legit and otherwise) reviewing our local dark attractions these days, there shouldn't be any problems finding the information you need. This is in stark contrast to when we first started out, when The HOD!!! was the only group doing this and blazed the trail, getting haunt owners on board with the idea that reviewers were good for both them and their customers. It sometimes wasn't easy-Cincinnati haunts in the mid 90's were extremely competitive with some owners displaying a high degree of paranoia. Many of them actually thought we were 'spies' from other local attractions (as if there were any real 'secrets' to be guarded) and in one case thought we were working for their ex-wife's lawyers! Happily, with a couple of exceptions, local attractions no longer constantly snipe at or undercut each other. There's a wonderful degree of cooperation and co-promotion, notwithstanding the 'illusions' some owners still have. And that's how it should be, as haunters have always been among the nicest and most giving people that we've ever had the pleasure to meet-we can count on one hand the haunt biz jerks we've met in 45 years, amazing when you consider the hundreds, even thousands, of people we've met. So let's thank a few of them. First on the list is the ownership, cast, and crew of Nightmare on Glenway (and Estates, and the Beach! 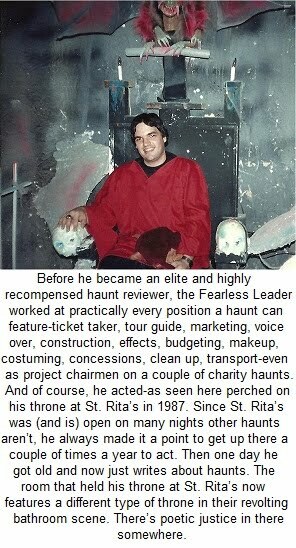 ), the first haunt that really accepted the HOD!!! with open arms, giving us unlimited access to their attraction as well as openly discussing every aspect of it. After being given the cold shoulder by some smaller events, having the event that revolutionized local haunting (moving it away from 'movie' rooms and towards highly detailed scenes and actors that embodied the essence of their characters) open their doors was a haunt nerd's dream come true. The many hours we spent photographing their scenes, talking to actors, observing their operations close up, and watching Bludzo reinvent the concept of what a haunt actor could do were high points. Then there's our core haunts-the fine folks at The USS Nightmare, The Dent Schoolhouse, St. Rita's, The Dungeons of Delhi, and Sandyland Acres-not to mention the Lewisburg Haunted Cave, a recent addition to our core that just made us wish we had gotten up there to see it years earlier. And of course the haunt that is closest to our heart (but don't tell anyone!!!! ), the Mt. Healthy Haunted Hall-the haunt that manages to combine the style of the 70's we grew up with and the haunt world of the new century and make it work. There are way too many individuals to list here, and we know we'd forget someone important-whether they be actors, owners, creative staff, construction, or concession workers. You can find most of 'em in the listings for prior year haunt awards below this article. We hope to see most of you in September and early October-just as a real customer this time! There's also the dozens, hundreds, of other haunts we covered over the years, many of them gone after one season, but living on in our heart (and also detailed for the ages in The HOD!!! 's files, which we're planning on giving to a local haunter for posterity). And then there were some that lasted and made huge impressions-the Sycamore/Deer Park Jaycees with their WSAI houses, the Hamilton/Fairfield Jaycees and their WMOH extravaganzas, and one of our favorite charity haunts, the Horseshoe Valley Haunted Trail. And then of course, the most important people-anyone that's ever read The HOD!!! or taken the time to email us with a kind word. Thanks most to all of you. Will The HOD!!! ever return? Well, it certainly can't be ruled out. We're in good health and excellent spirits, but these days we're involved in so many Japanese historical projects (whether it be doing research for bestselling authors, working on vid games and computer simulations, or DVD/Blurays) that it might be tough to find the time when we are here during haunt season. Each review we do takes a minimum of nine hours to write. Visiting the haunt, talking to actors and creative staff, taking and prepping photos, writing, putting the articles together-these aren't one paragraph reviews we're dashing off. And these days it's hard to justify investing all that time when we can be making a tidy sum doing our Japanese work. Not to mention spending time with our sig other, Ayame. And while in Japan her and I can go to the haunts they have other there, so I can combine my two favorite things! Ah, paradise! So thanks for everything, haunters of Cincinnati, Northern Kentucky, Dayton, Lewisburg, etc...it's been a real pleasure. Welcome to the HOD!! !’s 2013 Haunt Awards! Since we’re not running ratings with our reviews, there’s still a moratorium on Best Overall Haunt (Haunt Of The Year), Best Charity Haunt, Best Outdoor Event, Best Hayride, Best Multi Venue Haunt, and Best Trail. This is because we dispensed with public haunt ratings in order to concentrate on what makes each haunt unique and let the reader decide if that’s what they want to see-and also to help lessen the animosity that sometimes crops up between attractions as a result of the ratings. We will tell you that no haunt scored below an 88.0 (on a scale of 100) this season and that multiple haunts got 95’s (or above! ), making this one of the best local haunt seasons in memory. We’ve kept the actor and category awards along with introducing several new categories. Keep in mind that like ALL haunt ratings and awards, these are highly subjective and contain a heavy dose of our personal likes and dislikes (there really is no such thing as an objective haunt reviewer). Best New Event-Scream Acres Ct in northern Kentucky. While Scream Acres has been around for several years as a home haunt, this was their debut as a pro haunt. With plenty of room to expand and having the luxury of an entire year to work on the event, next year should be even better! Best Family Haunted Event-St. Rita's Haunted House. Best Facility-Scream Acres Ct, with arcade games, novelty machines, a gift shop with unique items, a ‘ghost’ photo op with provided props and of course the haunt itself–all under one roof. Moodiest Location-The Haunted Cave At Lewisburg.Not just Hell on Earth, but Hell IN Earth. Best Sets-The Dent Schoolhouse. We should just start calling this one “The Josh Wells Award”. Best Crew Of Actors, Touching Division-obviously, any haunt that allows its actors to touch the patrons has an advantage over those that don’t-so we’ve split our acting crew awards into two divisions. The actors at The Haunted Cave At Lewisburg were nothing short of amazing this season, giving The HOD!!! what might have been its most memorable haunt tour in 40+ years of haunting. From the water monsters to the prison guards, devils, zombies, mad doctors, ‘suit monsters’, and the hordes of chainsaw-wielding madmen, they were not only by far the most numerous group of actors (almost 100) but the most intense. No one will EVER walk of Lewisburg without feeling like they’ve run the gauntlet and survived. Best Crew Of Actors, No Touching Division-The USS Nightmare wins it once again. Not known for its actors in the early years, the Nightmare has become a template for any attraction’s actors to learn from. Varying their approach with the group and the time of night, they range from being entertaining to intense at a moment’s notice. They excel at extended periods of interaction with the crowds, leading to some most...unusual conversations. These are actors that really DO know how to “act”-ually act. Best Individual Actor-this year, a no brainer. It’s all about Zendar (Alex Anderson), The Dungeons Of Delhi’s 10-foot tall scuttling human spider with a bristling mouth full of knives. The agility and stamina Zendar showed was amazing-you’d think he was born like that. His body language in the role was equally impressive, moving in an appropriately spider-like style. Watching Zendar speeding across the queue area on all (elongated) fours and still overtaking running hauntgoers is nothing short of amazing. Also in the running was “Rattler” from the Mt. Healthy Haunted Hall-acting in the dark, he slithered around the mine voicing a guttural sound that was a cross between a rattlesnake, a wasp’s nest, and a gurgling slashed throat. And once you DID see him...having half his face ripped off explained a lot of the sound. Finally, there was the “Greeter” at Scream Acres Ct, a young lady who flawlessly delivered an extended speech and continuously popped out in crazy places throughout the tour, at one point climbing the walls! Most Intense Actors- The Haunted Cave At Lewisburg, taking full advantage of their dark and creepy surroundings. Most Athletic Actors-the staff of Scream Acres Ct.
Best Acting Comeback-Madd Mark at The Dungeons Of Delhi, turning in a hilarious over-the-top performance as the panicked father in the Demon Baby ‘live birth’ scene. I mean, it isn’t like he wasn’t prepared for something like this, already laying claim to Madd Matt as his progeny. Best Stunt Work-The Haunted Cave At Lewisburg, with the water monsters and the fire-wielding demons at the top of the list. HOD!!! 's Favorite Haunt Character-As always, it’s Bug Boy at the Mt. Healthy Haunted Hall. It was, it is, it shall ever be. Best Masks-Sandyland Acres Haunted Hayride. Best Character Makeup-The Dungeons of Delhi. The most creative and imaginative makeup work we’ve seen, all done on a budget. For a charity haunt to win this award is nothing short of amazing. Kudos to Andrea Pickerell, Matt Prater, Chris Coleman, Skittles, and Lexi Williamson for giving us the likes of Zendar, 666, Pencil Face, Eyeless Girl, Lady Satan, Zombie Master, and even New Blood’s ‘older’ look. Best Animatronics-The Haunted Cave At Lewisburg. They have HUNDREDS of animatronics, and are one of the few attractions around with the space to showcase the really large ones to their best effect. This year they added a huge dragon along with a couple of impressive free-flying specters (ghosts so huge that they’re piloted by someone sitting inside them). Best Sound-The Haunted Cave At Lewisburg, with a chaotic curtain of sound that comes from everywhere and nowhere. The soundtrack will be replaying in your memory long after you leave the event. Best Lighting-The Dent Schoolhouse. The most unobtrusive and natural looking light scheme around, yet each scene is perfectly lit-dark enough for atmosphere, light enough to showcase the amazing detail (with hidden pinpoint lighting focused on the high points). The USS Nightmare is another haunt that excels at this. Best Line Entertainment-Dent's menagerie of first-string characters along with the two films being shown in the separate queue lines. Best Special Event-USS Nightmare’s Extreme Night. Best Separate Event (Upcharged Or Otherwise)-The Haunted Cave At Lewisburg’s Historical Cave Tours. Best Sinister Atmosphere-The Haunted Cave At Lewisburg. Best Backstory And Theming-The Dent Schoolhouse. Most Improved Event-Dent’s Queen City Slaughter Yard in its transition from the Detention Hall . Best Value-St. Rita’s wins again at $7 (with a discount coupon). The Dungeons of Delhi and Mt. Healthy Haunted Hall aren’t far behind with an $8 ‘coupon’ price. The Nightmare has $13 Wednesdays, a great value for a pro haunt. The $10 lights off tour at Dent. The Haunted Cave At Lewisburg is an amazing value at $15 (with coupon) given that you can easily spend an hour and a half inside. Best Multi Venue Value-Kings Island Halloween Haunt. Coolest Room-The “Live Birth” at The Dungeons Of Delhi. 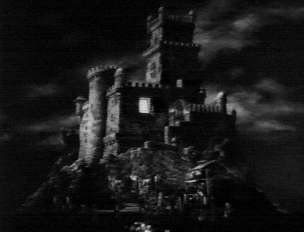 Haunts With Real Imagination-The Mt. Healthy Haunted Hall and Dungeons of Delhi. Favorite Effect-the Flying Specters at The Haunted Cave At Lewisburg. Favorite Extended Haunt Actor Performance-Mr. Giggles playing “Scream or Die” with girls at Sandyland Acres Haunted Hayride. Best Satan-The Dark Lord At The Dungeons Of Delhi, with his pal 666 as a bonus! Best Klown Area-the USS Nightmare’s Klown Maze. Toughest Maze-the Devil’s Maze at The Haunted Cave At Lewisburg-now with even more doors! Best Haunt Website-The Dent Schoolhouse. Jaw dropping concepts and videos. Best Facebook Page-Dungeons Of Delhi. THIS is what haunting is all about. Best Videos-The Dungeons Of Delhi. The evocative titles alone make them worthy of an award! Best Overall Marketing-The Dent Schoolhouse. During September and October, you can’t miss them. Best Gift Shop-Sandyland Acres Haunted Hayride, filled with bizarre and unique handmade items. It’s also the only area haunt where you can get a DVD of the event itself. Spirit of Halloween Award (for the attraction that best typifies a traditional Halloween)-Sandyland Acres Haunted Hayride. “Haunt and Staff We Still REALLY Miss” Award-Nightmare Estates. See also “Invisible Klowns”. “Buckets Of Blood”-the Dent Schoolhouse, which has doused itself in the red stuff the last couple of years. In a good kinda way. “Reality Show Waiting To Happen” Award-The Dungeons Of Delhi. All Madd Mark needs to do is splice together several of his event videos and add some of the earlier “Madd Matt/New Blood ones”. It doesn’t get any better than New Blood kidnapping children and then rushing off to Hooters! Maybe he could off Honey Boo Boo or the Duck Dynasty boys at some point, and the nation would be in his debt. “Beavis” Award (Fire Division)-The Haunted Cave At Lewisburg and Sandyland Acres for FIRE! FIRE! FIRE! Extra points to Sandyland for having remote control fire. “Beavis” Award (Poop Division)-The Mt. Healthy Haunted Hall, for putting it all on the line (or the ground, as the case may be) in their elevated outhouse scene. “Alcoholics Unanimous” Award-the undead crew of the USS Nightmare, all of whom were ready to kill each (even though they’re already dead) over the first mate’s stolen bottle of whiskey. No wonder they wrecked the boat! “Cutest Gals” Award-The Dungeons Of Delhi. And they’re really nice teens and good actors as well. Also see the next award. “Boobsalot” Award-Dent’s Queen City Slaughter Yard. Because it takes perky critters to make Uncle Charlie’s fritters. “I Ain’t ‘Fraid Of No Ghost” Award-the Sheriffs directing traffic at Dent. The drivers they had to deal with were a hundred times scarier than anything a haunter could dream up. “Haunt To Watch For Next Year”-The Mt. Healthy Haunted Hall, planning to put on a very cool concept. “Haunts The HOD!!! Would Have Wanted To Work At As A Teen”-The Dungeons of Delhi and Mt. Healthy Haunted Hall, who work wonderfully with their volunteers and give them a ton of input. “Klowns Who Are Actually FUNNY”-USS Nightmare. “Damnation” Award-the Klowns at Dent. “Mentor” Award-Madd Mark at The Dungeons Of Delhi. OK, that’s more than a few, but what can we say? We’re a whimsical site! Welcome to the HOD!! !’s 2012 Haunt Awards! Since we’re not running ratings with our reviews, there’s still a moratorium on Best Overall Haunt (Haunt Of The Year), Best Charity Haunt, Best Outdoor Event, Best Hayride, Best Multi Venue Haunt, and Best Trail. This is because we dispensed with public haunt ratings in order to concentrate on what makes each haunt unique and let the reader decide if that’s what they want to see-and also to help lessen the animosity that sometimes crops up between attractions as a result of the ratings. We will tell you that no haunt scored below an 90.0 (on a scale of 100) this season and that multiple haunts got 95’s (or above! ), making this the best local haunt season in memory. We’ve kept the actor and category awards along with introducing several new categories. Keep in mind that like ALL haunt ratings and awards, these are highly subjective and contain a heavy dose of our personal likes and dislikes (there really is no such thing as an objective haunt reviewer). First off, we’d like to extend our fervent apologies to our friends at Mayhem Mansion and the Chambers of Horror. An arm injury cost the HOD!!! three weeks of haunt season, our car’s security system kept locking our ignition, and with all the rain October saw we were never able to catch up. We’ll be covering both of these events next season nice and early. Also thanks to all the haunts that accommodated lots of reschedules, particularly the USS Nightmare, St. Rita’s, Mt. Healthy, and Sandyland Acres. Best New Event-Based on talking to our readers, Scaredown in Waynesville. We hope to get up there next season, especially if they get the Devil House rolling. We ain’t ‘fraid of no ghost! Best Crew Of Actors-Every haunt we went to this season had outstanding acting, continuing the trend being set the last several years. Long gone are the ‘performances’ we’d sometimes see in the early days of the HOD!!! where disinterested actors would push masks up on their heads, talk to their friends, and ignore the paying customers walking through their scenes. This season we had a pretty easy choice-that being the USS Nightmare. This might have been the best cast performance we’ve ever seen in a haunt. It was outstanding from both an interaction and physical standpoint, at once entertaining and scarifying. The actors used every type of approach imaginable and came off as real characters, not one-note cardboard cutout stereotypes. So kudos to the Night Watchman, Rat Lady, Museum Curator, The Captain, his cute daughter Anna, Stretch the Klown, the girly ‘Hang Around Klown’, the Ship’s Doctor, Vampire Overlord, the creations of the Doctor and Machinist, Galley Mates, Octoman, the Infirmary Staff, the rest of the crew, and the makeup artists who made them look their…err, worst-in a good way, of course. Best Individual Actor-Again, so many choices, but only one spot. New Blood at the Dungeons is always a favorite and put on a great show despite having health problems. The Great AliKillzam had a marvelously psychotic performance. For sheer shock value, you can’t beat the water monsters at the Haunted Cave, and their lady prison guards were tough as nails. Dent is loaded with icons. And we’ve already covered the Nightmare’s crew. Sandyland’s actors do a great job under difficult circumstances. But all told, the Night Watchman of the Nightmare was this year’s star. Great spiel, couldn’t be beat for interaction and had the energy to pop up several times along the winding path through the Nightmare’s cargo hold. He was the personification of a troubled spirit hanging onto the real world. Hope he got his bottle of liquor back from the Captain. Best Value-St. Rita’s at $7 with the discount is the grand prize winner. Mt. Healthy was even less expensive on selected nights. The Nightmare hasn’t increased their ticket price in several seasons. The $10 lights off tour at Dent. The Haunted Cave At Lewisburg is an amazing value at $15 given that you can easily spend an hour and a half inside. Best Gift Shop-Sandyland Acres Haunted Hayride, filled with bizarre and unique handmade items-not to mention Brenda's horror movie star autographed photos on display! It’s also the only area haunt where you can get a DVD of the event itself. Best Regular Media Haunt Coverage-Steve Novotni of Citybeat's ScaryBeat section, running not once but twice this season! Spirit of Halloween Award (for the attraction that best typifies a traditional Halloween)-Sandyland Acres Haunted Hayride. We were so glad we made it out despite the weeks of rain-this place recharges us. And for this year’s “HOD!!! Lifetime Achievement Award”, we’d like to give it to Allen Rizzo of the USS Nightmare. Under his watch, the Nightmare introduced pro haunting to Cincinnati (along with the Night of Fright) and has gotten better with every season. Continually innovating and trying out new techniques, the Nightmare is often taken for granted but like St. Rita’s, haunting in Cincinnati would seem empty without it. “Invisible Klown” Award-Bludzo up at Dent, who craftily schedules his appearances so they don’t coincide with our visits. “Beavis” Award-The Haunted Cave At Lewisburg and Sandyland Acres for FIRE! FIRE! FIRE! The 2011 haunt season was the first one for the new version of the HOD!!! and overall we’re happy with the way it turned out. It didn’t start out well, with the earthquake/tsunami in Japan forcing us to cancel all the features we had planned for the summer (a Haunted Cave At Lewisburg behind-the-scenes, Nightmare On Glenway and Night of Fright retrospectives, USS Nightmare and DoD previews, etc). Once haunt season began, however, everything proceeded like clockwork. We were fortunate enough to FINALLY get up to The Haunted Cave At Lewisburg and it fully lived up to its advance billing-a huge attraction that managed to have no ‘dead spots’ and was filled with jaw-dropping effects and animatronics. We spent four hours there, and it wasn’t nearly enough. Dent and the Nightmare continued to keep their attractions state-of-the-art and take them to even higher planes of excellence than years past-how many cities can boast not one, but two, nationally ranked haunts? Charity haunting has never been stronger with St. Rita’s, the Mt. Healthy Haunted Hall, the Dungeons of Delhi, and Mayhem Mansion all continuing to put on shows that would be pro haunts in other cities. The Chambers still fights the good fight against the Evil Empire up in Middletown, providing the Tri-State with its most confrontational crew of actors-and adding the fun ‘Last Ride’ coffin simulator. Kings Island did take a step back this season after all the ground they’ve gained since retheming ‘Fearfest’ as ‘Halloween Haunt’ by getting rid of the Psycho Path and retheming Death Row, but even there progress was made with the bandit attack on the train in Tombstone Terror-tory. And finally, Sandyland Acres not only gave us a new ‘funhouse’ style side attraction in Farmer’s Revenge, but continued to be the best place to hang out at on a frosty October night to get a dose of a traditional Halloween. Welcome to the HOD!! !’s 2011 Haunt Awards! You’ll notice quite a few changes this season-mainly, Best Overall Haunt (Haunt Of The Year), Best Charity Haunt, Best Outdoor Event, Best Hayride, Best Multi Venue Haunt, and Best Trail have all been retired for the time being. This is because we dispensed with public haunt ratings this year in order to concentrate on what makes each haunt unique and let the reader decide if that’s what they want to see-and also to help lessen the animosity that sometimes crops up between attractions as a result of the ratings. For what it’s worth, we will tell you that no haunt scored below an 88.5 (on a scale of 100) this season and that multiple haunts got 95’s (or above! ), making this one of the best local haunt seasons in memory. We have kept the actor and category awards, though, along with introducing several new categories. Keep in mind that like ALL haunt ratings and awards, these are highly subjective and carry a heavy dose of our personal likes and dislikes (there really is no such thing as an objective haunt reviewer). Best Crew Of Actors-The short version-any of the haunts we visited except for KI could have won this (and even KI had outstanding actors-but there are just too many spots for them to fill up to excel across the board). The Chambers, as always, lived on the strength of its actors. Mayhem Mansion continues to make a name for itself by concentrating on developing the talent of their characters. The Haunted Cave at Lewisburg had 116 actors, many in confining/restrictive costuming or masks (not to mention the ones immersed in water), and managed to find 116 people that did the job right. Dent, the Nightmare, Dungeons, Haunted Hall-all filled with memorable characters and strong performances, whether they were meant to startle, terrorize, entertain, or even get a few laughs. Haunt acting has never been better-greater opportunities for learning and networking on the Internet as well as at Haunt and Horror conventions have helped to elevate the performances of ghouls and creatures at even the tiniest haunts. It’s a tough decision, but we finally settled on the actors of the Dungeons of Delhi. They set themselves apart by not only having strong individual performances, but by displaying an outstanding level of teamwork between the creatures inside a room and even between ghouls throughout the house. Whether it’s the three girls in the nursery working together or something as simple as New Blood running outside to pummel Madd Matt, they created an environment where you can believe the monsters are all aware of each other-and hauntgoers. Best Individual Actor-Ah, so many good choices and show-stopping performances to choose from! We could go with Madd Matt and New Blood at the Dungeons, last year’s winners, and add Demonic Derek to the mix too. Reverend Rotts at the Haunted Hall outdid himself this year. The Butchers at the Chambers took the art of intimidation to a new high. Sister Sammi and many of her cohorts at Mayhem Mansion showed the boys how it’s done. The Devils and Lake Creatures at the Haunted Cave stuck in our heads. But we’re giving it to the Laundry Mate and his pal Herman at the USS Nightmare-for being simultaneously creepy, funny, psychotic, intense, and sustained-he put on a five minute performance while we changed the batteries in our camera. HOD!!! 's Favorite Haunt Character-As always, it’s Bug Boy at the Mt. Healthy Haunted Hall. Seeing where he ends up at the Hall every year is an annual HOD!!! high point! Best Value-The Dungeons of Delhi at a straight $8. The Haunted Cave At Lewisburg is an amazing value at $13 given that you can easily spend an hour and a half inside. Coolest Room-The “Tired Bones Retirement Castle” at Mt. Healthy-Bug Boy AND a crashing chandelier! Best Gift Shop-Sandyland Acres Haunted Hayride, filled with bizarre and unique handmade items-not to mention Brenda's horror movie star autographed photos on display! “Storyteller” Award-Allen Rizzo of the USS Nightmare, who not only has the best haunt stories but knows how to deliver them. Also a big thanks to the USS Nightmare’s web developer for putting together an HOD!!! “lightning” logo! Again this season, aside from 'extra events' like Dent's Detention Hall and KI's Wolf Pack, there were no new haunts of note in the Greater Cincinnati area. Even worse, Junction Nightmare, the Turpin Field Of Fright, and the long-running Loveland Castle weren't operating this season, thinning the ranks at an alarming rate. However, the remaining attractions comprised a very strong and creative group, giving the area one of the best lineups seen anywhere in the country. Dent and the Nightmare continued to push each other to greater heights and are world class attractions. KI had a bit of an off year but is still one of the leaders among amusement park events and the best evening of haunt entertainment around. St. Rita's, the Dungeons, and Mt. Healthy all continued to put forth high quality haunts, and as usual managed to get a little bigger and better as well. The three haunts are the area's heart and soul. Mayhem Mansion continued to develop and is on the verge of becoming one of the elite attractions in the area and has improved substantially every season it's been in existence. The Chambers and Springboro give Middletown a pair of intense events that not only entertain but do things the right way. Springboro was new to us and the Trail and Hayride are among the best of their type that we've seen. And finally Sandyland continued to embody Halloween, making it perhaps the most enjoyable experience in town. Congratulations to all of the HOD!!! 's 2010 awardees! Best Overall Haunt (Haunt Of The Year)-The biggest difference between the USS Nightmare and the Dent Schoolhouse the past few seasons has been the greater number of changes Dent has made. This season, the Nightmare's changes were commensurate with what had been done at Dent, and for all intents and purposes the two attractions are deadlocked. So congratulations to the Dent Schoolhouse and USS Nightmare, the HOD!!! 's Haunts Of The Year! Best Crew Of Actors-Wow, was this ever a tough decision. Acting at EVERY attraction we went to (except for a few KI attractions) was uniformly impressive with very little of the slacking that used to be seen in the 'old days'. The best actors overall on the nights we toured the individual attractions were those at Mayhem Mansion, but they have an advantage over everyone else in being able to 'soft touch' hauntgoers. The USS Nightmare's actors were excellent but don't get to do that-but even without touching, the Mansion's actors were just as good. So, we're giving it to both the USS Nightmare and Mayhem Mansion. Best Gift Shop-Sandyland Acres Haunted Hayride, with videos of the event, blankets, mouse pads, jars of unhallowed ground, Sandyland seed corn, and other unique items-not to mention Brenda's cool horror movie star autographed photos on display! Lifetime Achievement Award-Damien Reaper, who not only was one of the first area actors to create and develop a unique character back in his Dungeons of Delhi days but a pro who has tirelessly promoted the haunt industry, other attractions, and touted his fellow actors. Haunting is his life, and I'm sure he's got a lot of good seasons left in him. In fact, when we give this out in the future, we're going to call it 'The DAMNATION Award' in his honor. And yes, Bludzo would also have been awarded this, but he's written stuff for the HOD!!! so is ineligible. That doesn't make him any less of a haunt legend. Guess we'll throw in Brian Robbe, too. And to all of the HOD!! !s readers and the posters on the HOD!!! 's Message Board-thanks a million! We appreciate being talked back into doing reviews this season-it was the most fun we've had in years!